The young Han Solo film has been in the news a lot lately and not always for the best reasons. On Tuesday, Lucasfilm announced that the film would be moving forward without directors Phil Lord and Chris Miller, who had been working on the film since 2015 and had been shooting the movie since January. Following Lord and Miller's departure (or firing, depending on who you ask), it was announced that Ron Howard would be taking over the directorial duties. on the film. Production is currently on hiatus while Howard reviews the footage Lord and Miller shot, and is expected to resume filming on July 10th. While Lucasfilm claims the film will still hit theaters on its expected release date of May 25th, 2018, some have raised concerns about whether the film can still meet that deadline, given all the choas of the past week. TMZ caught up with Disney CEO Bob Iger and asked him about the changeover on the film and whether or not the film could still hit its planned release date. 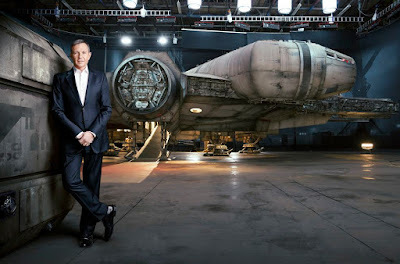 While Iger maintained that Howard was more than capable of making a successful Star Wars movie, and that the Han Solo film was not doomed, he declined to comment on whether or not the film would be delayed. The untitled young Han Solo film is slated to hit theaters on May 25th, 2018 and stars Alden Ehrenreich (Hail Caesar!) as Han Solo, Donald Glover (Atlanta) as Lando Calrissian, Emilia Clarke (Game of Thrones), Woody Harrelson (True Detective) as Beckett, Phoebe Waller-Bridge (Fleabag), Thandie Newton (Westworld), and Michael K. Williams (The Wire). The film is directed by Ron Howard (A Beautiful Mind), with a script by Lawrence Kasdan (The Empire Strikes Back) and his son Jon Kasdan (The First Time). The guy just looks like he is trying to go about his day while not at work. He has done great things at Disney and this guy asking questions wants to bother him on what looks like his private time.....come on people show some respect.